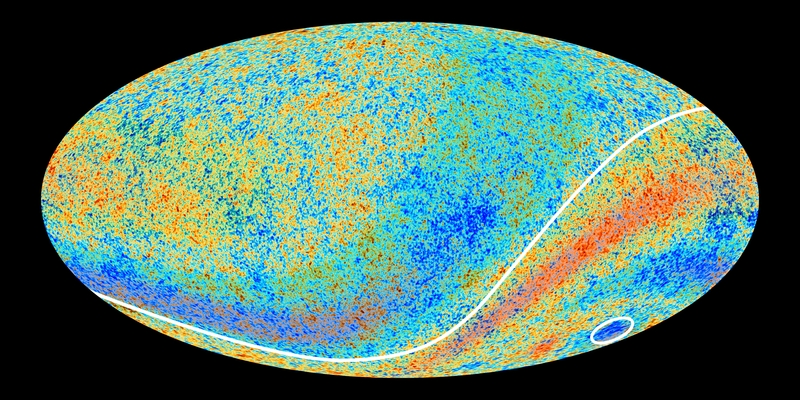 Two Cosmic Microwave Background anomalous features hinted at by Planck's predecessor, NASA's Wilkinson Microwave Anisotropy Probe (WMAP), are confirmed in the new high precision data from Planck. One is an asymmetry in the average temperatures on opposite hemispheres of the sky (indicated by the curved line), with slightly higher average temperatures in the southern ecliptic hemisphere and slightly lower average temperatures in the northern ecliptic hemisphere. This runs counter to the prediction made by the standard model that the Universe should be broadly similar in any direction we look. There is also a cold spot that extends over a patch of sky that is much larger than expected (circled). In this image the anomalous regions have been enhanced with red and blue shading to make them more clearly visible.